Bio-Principles is a teaching and learning solution that offers quality content in a dynamic and engaging format, all in one place and at an affordable price. 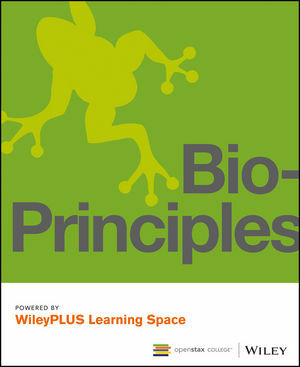 Bio-Principles pairs Biology content with Wiley's revolutionary teaching and learning tool: WileyPLUS Learning Space. WileyPLUS Learning Space contains your course content organized within an online learning community. Students have the opportunity to engage with key content, their instructor and their classmates. It invites students to ask questions, share insights, and personalize study materials - so they can invest in their own unique learning experience. 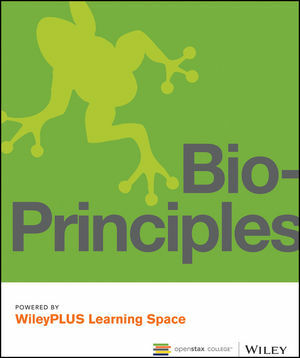 Bio-Principles combines adaptive self-study activities with an interactive and collaborative new e-text that establishes a personalized learning path for each student. Individual progress feedback drives students to study and practice more effectively and to achieve mastery of the content and a deep conceptual understanding. In addition, a unique suite of customizable and collaboration features offers students a personal study journal of course notes and activities, and encourages peer-to-peer discussions surrounding the content. Bio-Principles also provides a unique and personalized teaching experience for instructors, allowing them to easily customize and add their own material and engage students with pedagogies shown to enhance learning and retention. A sophisticated set of reporting and analytic tools provide greater insight into course activity and student progress. WileyPLUS Learning Space is an easy way for students to learn, collaborate, and grow. With WileyPLUS Learning Space, students create a personalized study plan, assess progress along the way, and make deeper connections as they interact with the course material and each other. Through a combination of dynamic course materials and visual reports, this collaborative learning environment gives you and your students immediate insight into strengths and problem areas in order to act on what’s most important. WileyPLUS Learning Space combines ORION adaptive practice and assessment activities with dynamic content as well as a suite of customization and collaboration tools. •Assets (narrative content, media and resources) are mapped to key learning concepts in an integrative and customizable manner. •Contains a number of assets for instructors including activities and resources designed to enhance critical thinking and facilitate a focused assessment. •ORION Adaptive Practice modules establish and reinforce a personal learning path by providing individual feedback, driving students to engage with interactive content—leading them to study more effectively and understand more deeply. •ORION Adaptive Practice Section – Contained in every chapter, these ORION adaptive practice modules contain a large number of questions than spans Bloom’s Taxonomy. Students will be presented with questions that ask them to evaluate, analyze and synthesize concepts beyond just the first two levels of Bloom’s. •Multiple resources for faculty to help facilitate a flipped classroom such as group-learn and in-class activities. •A great value to students with access to a powerful learning system at a considerable savings over current traditional course options. •Customization. Instructors can easily customize and add their own material, author & modify questions, assign reading and practice activities, and invite course discussions according to their own course design.